In creating the shows in 2018 we shared more than 300 songs, and listened to hundreds more. So what were the best of the best? We’re happy to share! These are Brian’s top 13 which he listened to on repeat in 2018, and a playlist of the top 57 in case you like what you heard and want to dig deeper. We hope you find some new tunes you love! Just a brief intro and then it’s all music for you to enjoy! This week on DC Music Rocks, Heather Mae, an artist who writes music for the light seekers and the good trouble makers, stops by for a chat. The episode also features great tracks by Schreiner, SHAED, MioTiga, and Crys Matthews. THIS IS THE ONLY PLACE ANYWHERE YOU CAN HEAR THIS SONG, it’s not on the web anywhere, and only available as part of the video on her Kick-starter page. 1) OUR ONE OF A KIND HOLIDAY PLAYLIST! Enjoy our Holiday Playlist! We created it in collaboration with Listen Local First in DC! Fantastic 4 hour playlist to have on at your holiday events!! Finally a playlist of holiday songs you HAVEN’T already heard for years! 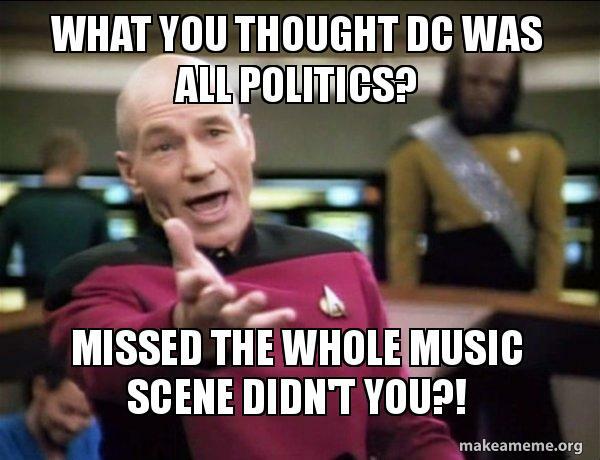 Enjoy the holidays AND support DC’s music scene! With the latest updates we made, we’re now covering a 50 mile radius, which is now more inclusive of shows in the suburbs! We hope you’ll take a look, see what kind of great shows are happening in your neighborhood coming up! Remember you can filter by location, hit the gray button and filter by City and State near you! **Our local music calendar is the only place showing you where DC’s talent is playing around DC! See the full list! Thanks to Lindsay from the Black Cat for hanging out with us in the studio this week! DCMR is looking for help. Social Media and Website Content Specialist - 100% virtual/remote position. 5-10 hours/week. Must be interested in music, local music knowledge a plus but not required. Experience with simple web design such as Squarespace, Mailchimp, Social Media, and Hootsuite are a plus. Motivated to take on more also a plus. This isn’t a high paying position but if you’re looking for a fun side regular side hustle that you can do from home, this may be a great fit. Must be available to complete a few hours of work sometime Friday-Sun, and Wednesday Morning-Midday. Interested? Know someone who would be? Send an email to dcmusicrocks@gmail.com and include a paragraph or two outlining how you/they relate to the above. Lindsay is the talent buyer at Black Cat. She got her start booking benefit shows in high school for the American Cancer Society. This sparked a lifelong interest in booking shows that have a positive social impact. Black Cat has been an independent bastion in the Washington DC nightlife scene for 25 years. Lindsay has had a major role in the office of Black Cat during the most recent five years in the club’s storied history. Lindsay is a headstrong individual who values ethics and principles over monetary gain when it comes to booking. You can also find her in the garden, at a pottery wheel, or rolling for initiative with her D&D party all while daydreaming about her next major crafting or work project. Brian: On D.C. Music Rocks, we're shinning a spotlight on the great songs, artists and incredible people to keep you informed about your local music community. Lindsay is the talent buyer at Black Cat. She got her start booking benefit shows in high school for the American Cancer Society and this sparked a lifelong interest in booking shows that have a positive social impact. Black Cat has been an independent bastion in the Washington, D.C. nightlife scene for 25 years. Lindsay has had a major role in the office at the Black Cat during most of the recent 5 years and in the clubs storied history. So Lindsay, as a headstrong individual who values ethics and principles over monetary gain when it comes to booking, which is an amazing phrase to hear to come out about you. I first came across Lindsay because Fellow Craft has played shows at Black Cat and I certainly have heard of her for so long. I've been a fan of the work that you're doing and the club for so long, so it is a treat to have you sitting here with me. Thanks for being here. Lindsay: Thank you. Thank you for inviting me. Brian: Now, tell us about Black Cat. It's the story ... Why is it called the Black Cat? Or is there a story there? Talk about the history. Lindsay: I could tell you probably a better story of why the ... You can write a check to the Black Cat or to Circle One Productions. Brian: Oh that's the proper business name? Brian: Yeah, where does that come from? Lindsay: Circle One Productions is a joke that Dante [Frondo 00:01:25] our owner has ... Dante's inferno, the first circle of hell, is really where that comes from, so the Black Cat itself is probably more of just that same ... I don't think there's a specific black cat. I do know that the name has been in his family for years. There was a restaurant in the '20's that was called the Black Cat that has been carried down, so the original story for the name, I'm not sure how far back you'd actually have to go to get it. Brian: Interesting. So if you're ever at the Black Cat and Dante is there, ask him. Maybe he might know. Lindsay: Or yeah, his ancestors might, yeah. Brian: Or his ancestors, right. It's buried in the history books somewhere. Lindsay: It's been for a very, very long time. Brian: The building does? Tell us more about that history part. You said it's been a part of the culture in D.C., can you share a little bit more about that in terms of how it's connected to the scene? Or some of that specialness, in your opinion. Lindsay: The Black Cat? Sure. When Dante opened the place, he was in his early 20's. It's been around for a long time and a lot of his reason for opening it was to create a space for the community for the music that he wanted to play and wanted to share, to be there. So his perspective has always been really great for us in having him still be around. That's kind of one of the things that makes the mom-and-pop business so special, I guess, to the community is that it does focus on things like, "Hey, is this something we want to do? Is this something that would benefit our community? People that we care about." Definitely want to keep the lights on, but that's also a reason why we do want to get smaller, we do want to not kind of fall into the hype machine if you will and kind of stick to our guns and actually try to benefit that community and keep things on the lower side. Brian: Wow, I love that. I'm such a fan of the Black Cat, and if you've ever been to the Black Cat, where is the Black Cat? Lindsay: It's on 14th street, between S and T. It's actually on the same block, if you remember the old Black Cat, it's the same block, it's just a couple doors down. So I joke, this upcoming renovation is our next iteration, our next Cat life, right. Brian: There's nine lives that a cat has and we're getting through some of 'em. Brian: Oh I like that. Now, for you then, how did you get hooked in with the Black Cat? Lindsay: Oh, man I remember going as a young-un. Their only age venue and then kind of entering that community then, but working there when I was 21, I moved back to D.C. to help my sister out who was going through a hard time and ended up staying and I had a good friend named Alex who played a lot of the shows we mentioned earlier back when we were a teenagers together and he was like, "Oh yeah, I started working door almost 8 years ago at this point now." And started working the kitchen and then started working for Vicki who taught me ... Her and Dante taught me everything I know and yeah, that's I guess how that happened. Lindsay: The good ole fashion way. Brian: Right, so you got connected in. And that was how long ago now? You've been ... We said five years? Lindsay: Eight with the club. Brian: That's amazing. And especially these days, people don't tend to keep jobs for eight years so it's kind of amazing that you're ... Goes to credit the great family vibe and the love that the Black Cat creates. Lindsay: It is. It's really special for me. As someone who moved around every two years growing up, I think the idea of community is something that is a beautiful thing in this world, it's cool. Brian: Yeah. And you moved every two years because dad was military? Lindsay: Yeah, my dad was military, which brought us to ... He worked at the Pentagon when I was 15 to 18, which is when you can reference those, we call them "die cancer die fest" at Cancer Fest and those would be back in that day from 15 to 18 in Northern Virginia would have been the area for that. Brian: That's so cool. And you know what? I have the same story, my dad was military and he was stationed at the Pentagon and I was here as a kid too. Lindsay: We're many of us around the area. Brian: Right. Absolutely, it's that connection. Now talk about you on the personal side, so outside of the Black Cat, hobbies? What do you do in your free time? Free time, what is that? Lindsay: But I have it. So many things, depending on how I'm feeling that free time. One of the things right now that I'm so excited for is April 15th is our last day of frost. I'm a big gardener so I have been germinating since January and I have ... I was joking, I think I have about 85 plants and only room for 28 of them, so if anyone needs any plants, hey let me know. I'm trying to get rid of some. It's a good news when everything germinates but that and I'm building a pottery studio in the garden this year to hopefully bring some pottery skills back into the backyard. And I'm a big hand ... Crochet, knitting, sewing. Lindsay: I like to create my own things. Lindsay: Yeah I guess so. Brian: So you got the creative side that's not necessarily making music but it's making other art pieces and stuff like that. Lindsay: Making clothes or fill in the blanks. I have a nephew on the way so making a lot of baby booties right now. Brian: There you go. Excellent. Oh god, love those nephews. Absolutely. Now, talk about the funniest moment in the history of Black cat. What comes to mind? Lindsay: I mean, this one was hard for me because I find myself dealing with either things that are tragically hilarious or things that are coincidentally what? Oh my gosh how funny. There's nothing really that's, "Oh ha, ha, ha that happened. That's hilarious." So, one story that came to mind is just this funny moment, we had The Wallflowers play and man it was not the right year for them. They had come back and we were pushing the show, it was a great show in the end. It worked out fine, most things do, that's why ... Everything's fine in the end, it's just all the stress leading up to it. And I remember, we typically don't have many runners, we're not that big and so I had to pick up Jacob Dillon that night and as we're driving back to the club he's getting ready, we're just chatting about whatever in the car on the way to the club, it's about a five minute drive and I just chuckled and will never forget the moment I looked down and realized that there was only one headlight and it just stuck with me really hard. It was a good moment. Brian: Oh my god. And if you didn't catch that, think about it, do a little googling and see if you catch what she just did there 'cause oh it was so good. I love it. Now, if you could offer one piece of advice, what would it be? Brian: Does that have to do with when a band says how many people they can bring? Or what else are you referring to there? Lindsay: I guess most of the time dealing with, "Hey can I bring fire inside?" Like no, "Oh, oh please?" Or do it anyway, or things like that. It's just ... or "Why?" 'Cause of this thing, it's just easier I feel like when you're honest with people and even when it comes to shows that maybe don't do as well or shows that do way above what you would think, everyone can get their high and low points and I guess about being honest with yourself and honest with what you're doing is always gonna kinda come out on top on the end in my opinion. Brian: Yeah. Got it. That makes perfect sense. And actually, while we're talking about that, I was just curious, when a band emails you and says, "Hey, we want to play at the Black Cat." What do you look at? What are you thinking about? Lindsay: Oh man. So many things. Well, the first thing right, is hey does this fit? Does this fit our genre? Brian: What is that genre? Lindsay: Variations of alternative rock basically. Lindsay: Right? So that's where ... And now genres are so ... They just bled into each other so much that it's really hard to kinda ... It's one of the tough games that I play constantly. Lindsay: And local is a little different 'cause we want to maintain that community. I want to mention Heather May and Chris, are more singer, song writer types, which you won't typically find, those kinds of artists on the more national scale come through, but locally of course we would want to cater to that more. So, if it fits the genre, if we have the date right? 'Cause coordinating that calendar with two rooms, it's a lot to try to figure out a lot of, "Hey how long can you wait? What do you need to do?" And a lot of back and forth happens before you come to a conclusion. Brian: Got it. So the genre and the date, and the potentially how many people they can bring. Brian: Right it's not big enough for five people. Lindsay: There's just so many question that go into it, so a lot of the hoping we can do with the new room on the third floor is a real simple setup. Hey, plug in, play and cut down on the expenses to go back into the local community, which we'll do hopefully. That's the plan. Brian: That's awesome. I love it. And one more time, if they want to find out more about what's happening at Black Cat, where do they go?